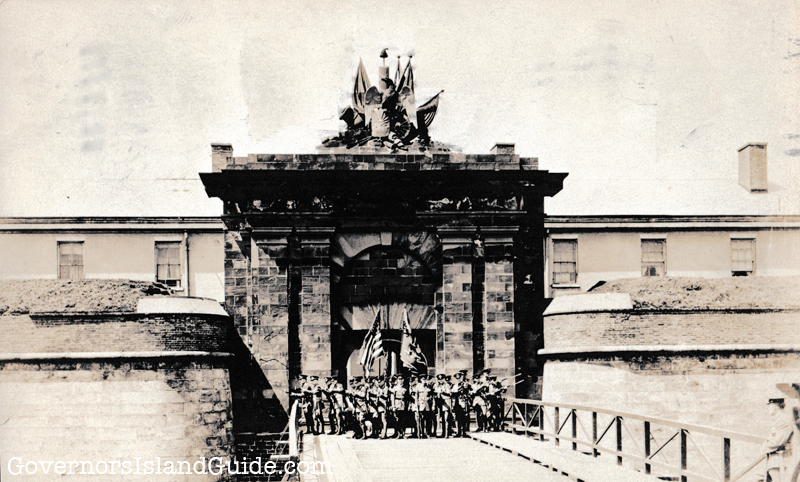 The Fort Jay Gatehouse and Eagle Sculpture in a vintage 1933 postcard. There are only five days left to vote in the Save Our Eagle campaign, to win funding from American Express to help restore the eagle sculpture above Fort Jay. There is a three-way push from the Governors Island National Monument, Friends of Governors Island, and The Trust For Governors Island to get the vote out. As we reported last month, the Governors Island National Monument is now in a competition with other national parks across the nation to try and get a piece of the $2 million grant to help bring back the historic 1790s sandstone sculpture to a better state of preservation. Out of twenty parks, only five will receive funding and split the pot. Voting ends July 5. The social media hashtag is ‪#‎SaveOurEagle‬. You can vote once a day, every day, here. Get your friends, family, and followers to back the effort. (Voting online is extremely wonky, so have some patience. Logging in via Facebook is the fastest way to vote). The partner is National Geographic. This weekend free tours are being offered by National Park Service rangers to take a climb up on top of the scaffolding to see the ongoing work. The NPS already got some funding and that is being used to repair damage from Superstorm Sandy. The sandstone eagle sculpture atop Fort Jay’s monumental arch on Governors Island is a one-of-a-kind national treasure and work of art, but two centuries of water, ice and pollution have damaged this national symbol. A $245,000 grant will stabilize it. 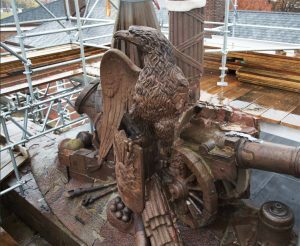 To help save this unique piece of history, Fort Jay’s eagle statue was selected a part of a national competition through a partnership between the National Trust for Historic Preservation and American Express who will award $2 million in grants to historic sites in need of preservation as decided by popular vote. Over the years the eagle has been damaged numerous times. It has lost wings, flags, and big chunks have fallen off. Matthew Brady’s photo, which was taken in 1864, is the earliest known photo of the Fort Jay Eagle. Among the many supporters of the effort are the former Army and Coast Guard service members and their families who once lived on the Island when it was a military base. They have been promoting it on their Facebook groups, which is nice to see.